Meech International is set to use CHINAPLAS as a launching pad for its brand new static elimination bars, the Hyperion 971IPS and Hyperion 929IPS, along with its recently released non-contact web-cleaner, the CyClean. Headquartered in the UK, Meech has further developed the recently released Hyperion 971 bar to bring to market the 971IPS (Integrated Power Supply). The 971IPS allows users to run the long range ionising bar from a 24V power supply and borrows some of its features from the company’s first true closed-loop Pulsed DC static control system, the popular 977CM, although in miniature form. For instance, Ion Current Monitoring technology allows the performance of the bar to be metered and also provides an alarm signal to advise the operator to clean the bar. For more demanding installations, Meech have developed a remote programmer, the Hyperion BarMaster. Connecting the BarMaster to the 971IPS enables the adjustment of the balance and frequency of the outputs, as well as setting the alarm parameters. Once the output has been optimized and the alarm levels selected, the BarMaster can be removed and used to program the next bar. 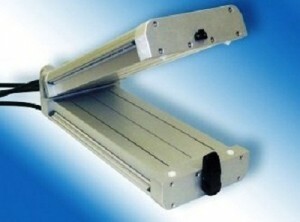 As for Hyperioin 929IPS, it is a 24V, plug and play bar, which provides good ionisation for short to medium range applications of up to 450mm. Like the long-range 971IPS, the 929IPS features Ion Current Monitoring technology to provide performance alarms and cleaning alerts. Compatibility with the Hyperion BarMaster programmer allows the modification of output settings, depending on their requirements. This adjustability will be of great benefit to high accuracy applications, such as RFID converting machinery. Meanwhile, the CyClean is a compact, non-contact, double-sided blow and vacuum-based web cleaning system which flows contaminants into an inline filter unit.